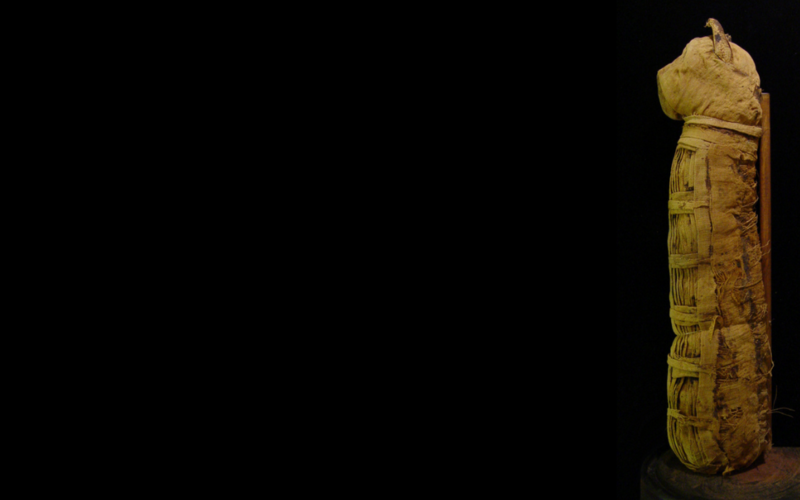 The Object of the Month for August was chosen, researched, and written by our work experience student Freja Craik. Freja is studying for her A-Levels which include Art and History at Bennett Memorial Diocesan School. The Object of the Month for August is a mummified cat from Ancient Egypt held on display at Chiddingstone Castle. The creature has been bandaged in linen several times, which had to be intensely washed, stretched, fringed, and folded before applying it on the corpse - in order to provide suitable conditions for preservation. The corpse would have been embalmed with oils and sweet scented spices, furthering the process of preservation for the animal in the afterlife. 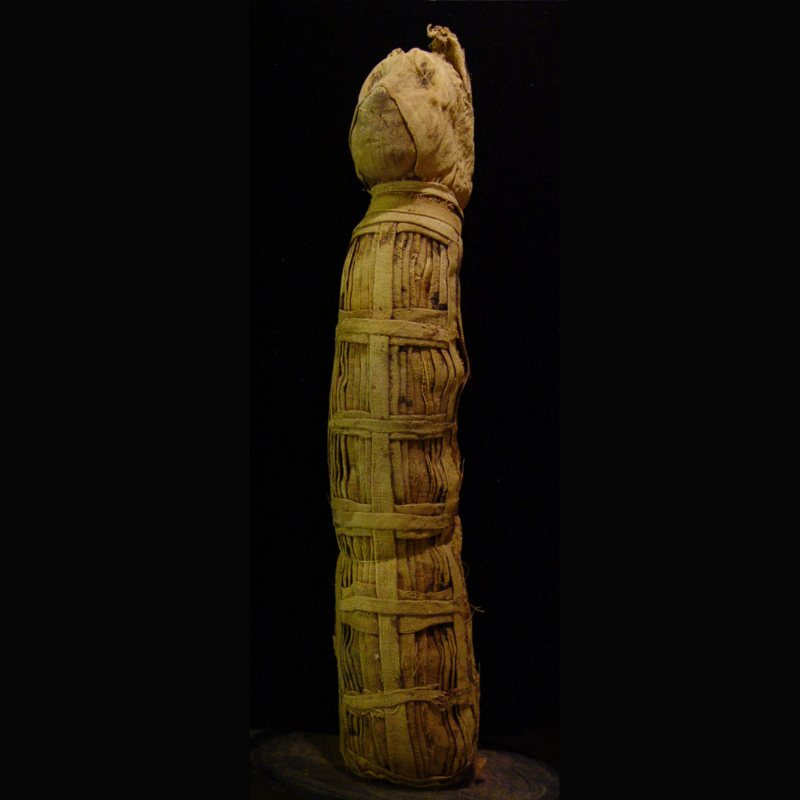 The entire process of mummification was in itself undoubtedly time consuming, so for the people to preserve the corpses to the extent in which they did, highlights the importance and authority of the creature in Ancient Egyptian society. Not only were the animals given the same burial as humans, but they were places in tombs and given dead rodents - such as mice and rats - with the idea that they would be their initial source of food in the afterlife. There are extensive similarities between the burial procedure for respected animals and those of humans, however due to the size difference, humans had a more intricate process. 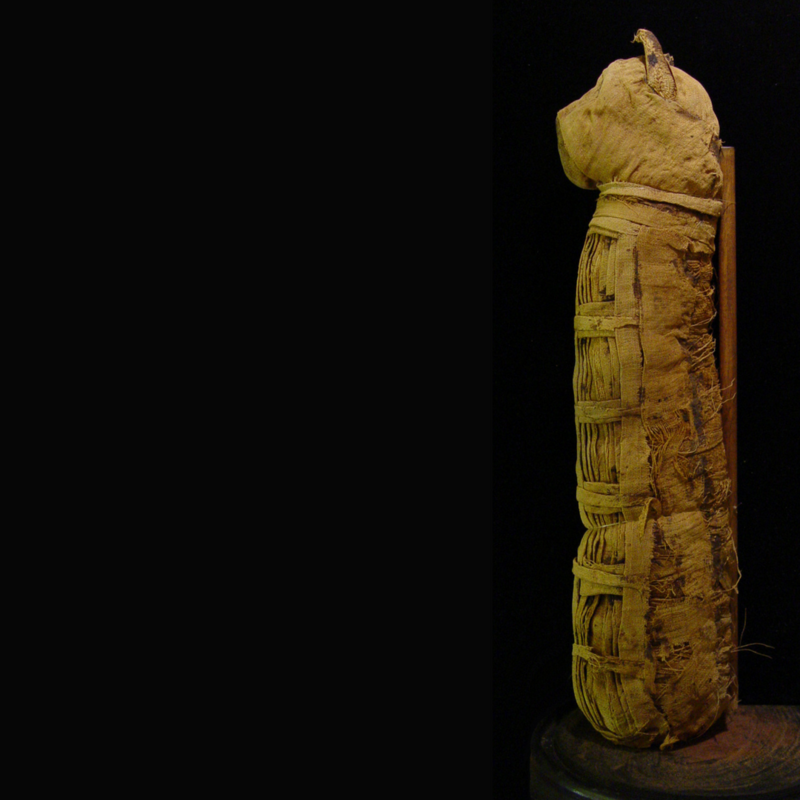 Cats were mummified in linen - the Egyptian miracle material. Linen was a source of key development in Ancient Egypt, being used for agricultural income, in fashion, packaging, storage and in burial. In fashion, linen could be fringed and adapted to create an alternative style, which allowed people to differentiate between those who desired to prove their wealth and those who didn’t. Green linen came from the direct colour variation of the crop. Dyes such as red and blue were introduced but they rocketed the price of the material significantly, once again projecting social status. The vibrancy of its uses within fashion distracted from from its disturbing role in burial. In Ancient Egypt animals were treated with great respect. This was due to the fact that they considered individual creatures to be reflections of their own self-image. They were believed to channel common human characteristics. Because of the way in which they were praised, multiple animals obtained roles as deities within Egyptian religion. A cat’s status was that of a demi-god, but they also had direct association with Gods and Goddesses across Egyptian tradition. Due to their importance, the penalty for killing a cat was death, which heightened the value of their existence. Initially, their role was to secure crop success by ridding the lands of rodents, which they were heavily praised for. With this came a gradual acceptance and inevitably, their guaranteed permanent accommodation with humans. 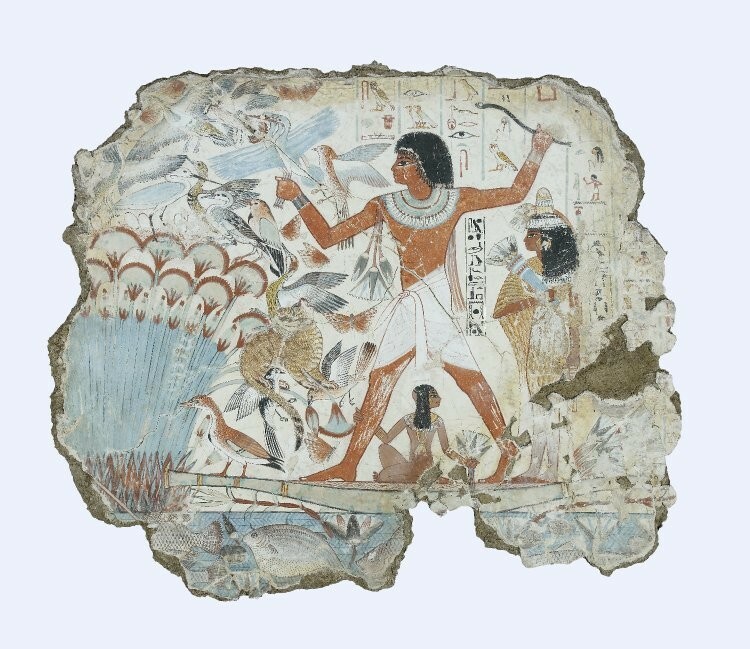 In Egyptian tomb paintings, scenes would depict the conquest over chaos as cats would be seen restraining the flight of wild birds, enhancing their status as valuable companies and enforcers of structure. Cats were often depicted with glimmering points of light painted into their eyes which highlighted their divine connection. They were often included in domestic scenes alongside their owners which portrayed them as loyal companions, with a deep rooted connection to humans. Their status didn’t differ between domestic or feral, they held the same value with or without human interference as they fed on the creatures that the Egyptians were repulsed by. Cats were even involved in life beyond physical interaction, for instance, in the subconscious. Superstition reigned superior in Ancient Egypt and if you were to visualise a cat in a dream it would foreshadow a successful and flourishing harvest. This depicts their authority in and out of consciousness. Egyptian Gods were frequently associated with felines, the most famous deity being Bastet, who was the Goddess of domestic presence, female secrets, cats, fertility, and childbirth. She was a protector over women and children, predominantly within the home. She would banish evil spirits and disease from households. She was the daughter of the sun God, Ra, who was one of the most important Gods at the very top of the religious hierarchy. Ra was associated with the sun and like the sun was believed to give life to crops and promote growth and development in all areas o f life. As Ra’s daughter, Bastet was believed to protect and preserve the agricultural land that her father supported and humans benefited from. 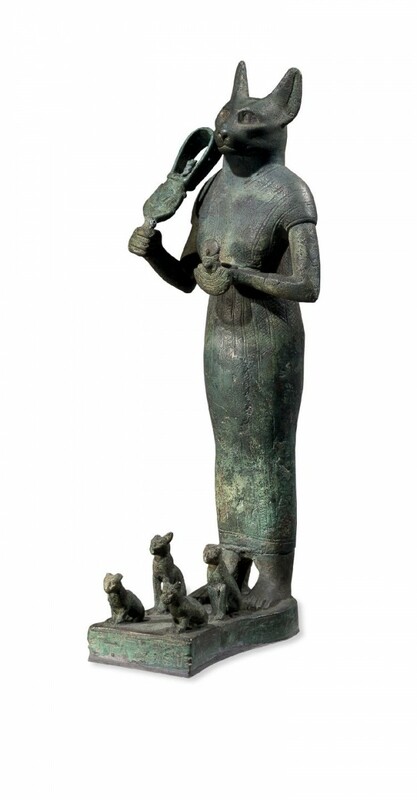 Bastet’s traits as a Goddess reflected a cats natural instict to remove rodents and therefore protect crops. She was initially presented as a woman with the head of a lioness but gradually she developed into a softer character, because of the acceptance and companionship that was shown towards the figure of the cat in Ancient Egypt. She was adored and feared as two of her titles are ‘Lady of Dread’ and ‘Lady of Slaughter’, demonstrating how she desired structure and if it wasn’t delivered then she could be threatening. Ra, ‘The Sun God’ held an element of his persona called ‘Mau’ - the divine cat. The Goddess of Justice, Mafdet also had her own cat persona. An area of Egypt was dedicated to Mafdet - Bubastis - and it became one of the supreme cities in Egypt, flourishing in wealth and produce. Felines were also physically affected by this shift of appreciation. The domesticated lifestyle saw changes in their fur – they no longer had to need to be camouflaged. Their size decreased and muscle lessened – as their diet adapted to what humans could provide. They also exercised less as they had a place to reside. Their brains decreased in size as they didn’t need to hold all the once valuable survival instincts anymore. Lastly, they became much more tolerant of human interaction, which is why we now consider them to be domesticated animals, ones we would own, provide for and accommodate as pets. The mummified cat at Chiddingstone Castle would have been considered both a sacred animal with connections to the Gods and a beloved household pet. For these reasons it was carefully prepared and buried with its owner, so it could continue to fulfil these roles in the afterlife. Find this important and fascinating object on display as part of the Ancient Egyptian collection at Chiddingstone Castle.